Over the course of your university life you will inevitably be tested by Allah SWT. These tests may come in the shape of loss of a loved one, failed exams, or feeling alone. These trials may become too much for you to go through alone and that is absolutely fine! We understand that we all need extra support sometimes. The Welfare Team are always here to support you with any issues you have. We aim to focus on the health and wellbeing of all the Muslim students at KCL. Whether you need advice, a shoulder to cry on, or just someone to vent to, the welfare reps are always here to help! We also have excellent links with professionals in the mental health field if that’s something you’d prefer. We will also frequently be updating our new blog Please Try To Understand - a collection of anonymous pieces of writing to help you feel less alone. If you want to speak to someone on the welfare team, you will find all of our details in each campus prayer room. Don’t hesitate to contact us! 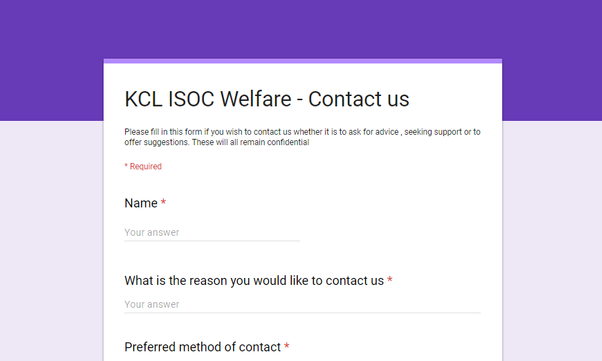 You can also contact us using the form below, and we will get back to you as soon as possible inshaAllah.